If a company is one standard deviation above the mean (with a score of 60), its results are in the top 15% to 20% of a larger universe of 693 companies that have been ranked by the Drucker Institute. If a company is one standard deviation below the mean (with a score of 40), its results fall in the bottom 15% to 20% of that larger universe. The fact that a firm is ranked toward the bottom of the Management Top 250 does not mean that it is not managed effectively. The lowest-ranked firm on the list is still in the top 40% or so of a much larger group of companies that was analyzed. In calculating scores, a slightly different weight was computed for each dimension based on the degree to which it was found to contribute to overall corporate effectiveness. Those weights were as follows: Customer Satisfaction = 18%; Employee Engagement and Development = 20%; Innovation = 20%; Social Responsibility = 23%; and Financial Strength = 19%. For a list of the 37 indicators, click here. Its market capitalization was $10 billion or greater as of Sept. 16, 2016. Its shares were a component of the Standard & Poor’s 500 stock index as of October 2016. It was a publicly traded component of the 2016 Fortune 500 list published in June 2016. The Management Top 250 includes U.S. companies, as well as companies that have principal executive offices outside the U.S. but are listed in the Fortune 500 or have stock that is a component of the S&P 500. To be included in the larger universe of 608 companies, at least two valid indicators had to be available for each of the five dimensions. Any company for which fewer than two indicators were available in any dimension was excluded from consideration. Also excluded was any company that met the criteria noted above but ceased to be a stand-alone entity because it merged or was acquired before June 30, 2017. The Drucker Institute obtained all of the data needed to produce the 37 indicators during the first half of 2017. In all cases, this was the most recent data available at the time. The Financial Strength indicators cover the 12 months ending June 30, 2017. Where available, data was obtained going back to 2012 on a year-by-year basis. This historical information provides a baseline for measuring change within each of the company’s five dimensions of performance and in terms of its overall effectiveness, as well as for spotting longer-term trends. The underlying data used to compute the 37 indicators was not available in every instance for every firm being ranked. Where there was a missing field, a score was derived by computing the average of that dimension’s indicators for which the firm had a valid score. For example, the Customer Satisfaction category has eight indicators. If a firm had a valid score for six of those indicators, the firm’s Customer Satisfaction score became the average of the six. Taken together, the five dimensions reflect a single higher-level construct (corporate “effectiveness”) and that each has a substantial factor loading on that construct. The following are the range of loadings observed for each dimension using a variety of statistical estimation methods: Customer Satisfaction is 0.56 to 0.68, Employee Engagement and Development 0.51 to 0.66, Innovation 0.58 to 0.83, Social Responsibility 0.68 to 0.81 and Financial Strength 0.56 to 0.63. The selected third-party metrics serve as valid and reliable indicators of those five dimensions. The average factor loading within each dimension is 0.65. In addition, during the prototype phase of the model’s development, the Drucker Institute worked with PayScale to field a series of survey questions to the employees of 41 companies. These questions aimed to gauge how well these employees exhibited behaviors and mindsets that were in line with the various Drucker principles. 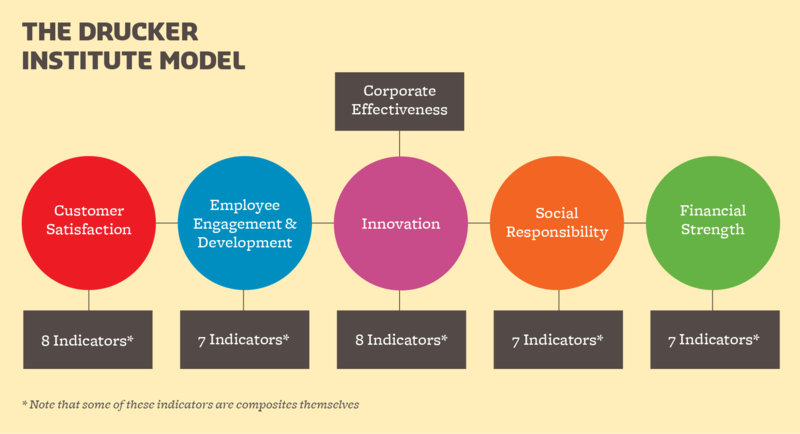 An analysis of the results showed that companies where employees self-reported that they were adhering to the Drucker principles scored relatively high on the corresponding indicators used in the model. This convergence gave further support to the model’s validity. Tests were also conducted to determine how volatile the model is. Too much volatility would suggest a high degree of randomness, while too little would suggest that the model is insensitive to real change. To help address this question, the Drucker Institute examined the percentage of firms that remained in different performance bands (e.g., Top 25, Top 50, etc.) for two consecutive years. Based on this, the model was found to have a level of volatility about equal to other well-known “best of” lists produced by two business publications.